Fryerstown is a village and a former gold town with numerous historic sites and relics. It is on Fryers Creek, a tributary of the Loddon River, 10 km south-east of Castlemaine and 100 km north-west of Melbourne. The creek and the town were named after a pre-gold rush pastoralist, Peter Fryer. Gold was discovered in Fryers Creek during October-November 1851. Many of the miners were of Methodist persuasion, there being Wesleyans, Bible Christians and Primitive Methodists within ten years of gold being discovered. The Methodist church which remains in Fryerstown was opened in 1861, eight years after services were first held there. An Anglican church (1861) is also extant. A school was opened in 1853. Its most famous pupils was Frank Tate (1864-1939) born in Mopoke Gully east of Fryerstown, and Director of Education from 1902 to 1928. A Catholic community settled at Irishtown, 2 km south-west of Fryerstown. After the abatement of the early gold rushes Fryerstown settled down to a population of fewer than 800 people. There were numerous gold workings in the nearby area, however, boosting the district’s population and supporting the town’s five hotels. 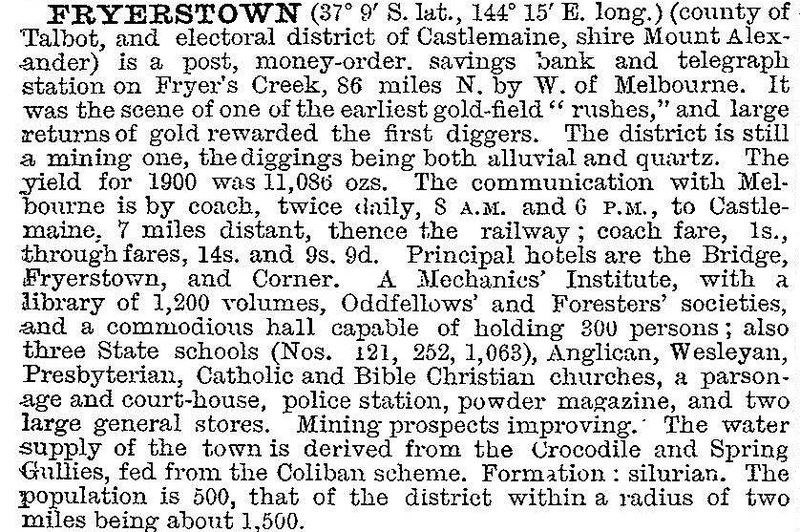 Fryerstown had a court of petty sessions and a mechanics’ institute, and was the administrative centre of a Road District and the Mount Alexander shire (1871) until about 1911. The 1911 census for Fryerstown recorded 574 persons but the next one (1921) recorded a loss of more than two-thirds of the population. Mining and dredging had waned and the district had mainly an agricultural population. The school closed in 1967, the same year when local people gathered to witness the switching on of electricity. Fryerstown’s court house, mechanics’ institute (1863), church buildings, mine ruins and cemetery remain. The Herons Reef cultural heritage diggings site, 7 km south-west of Fryerstown, preserves numerous relics of gold-mining methods. A popular antiques and collectables fair is held in January each year. In 2010 the old school house (1915) was refurbished to form a community hub and garden. The 2011 census area included the former villages of Tarilta, Vaughan (see separate entries) and Glenluce.